You guys, Summer is almost here! Today I wanted to share one of my family’s favorite Summer-time side dish, in a post that is sponsored on behalf of Produce for Kids®. 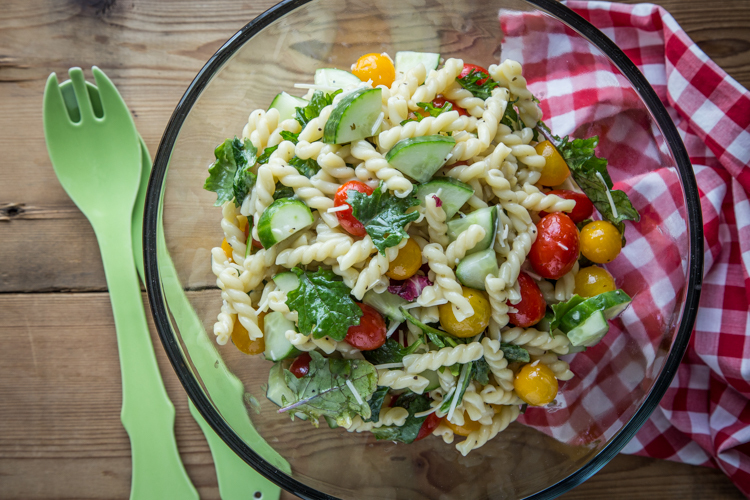 This Summer Pasta Salad is packed full of veggies – tomatoes, cucumber and even greens and lightly dressed with one of my very favorite dressings. You’re going to love it! I’ve been talking your ear off over the last few weeks about our big move. Moving is beyond tricky. If you’ve done it recently, or even not so recently, I think you know exactly what I’m talking about. I couldn’t be more pumped about moving to our new house and neighborhood. It will be a huge adventure for us as a family. The problem is, all the waiting. It is not easy for me to wait on the sidelines while everything else just has to happen. Inspections, appraisals, title company business, lenders, closing dates – it’s one frustratingly slow mess. It kills me that there is nothing that I can do to speed the process along. No amount of work on my end will make anything go faster. To help the time pass quicker, I am focusing on cooking and keeping the kids entertained during their first week of summer break. This week, C had Safety City and A and I got to spend some very rare time together just the two of us. We went to the library, played numerous games of UNO and Battleship, and of course, went grocery shopping. A is my little grocery shopper. He hardly ever gets to go because now being in 1st grade (er…actually 2nd grade, now. How did that happen so fast?!!) I usually do the shopping while he’s at school. This week we hit up Meijer on Monday because I wanted to get a few things to make some great side dishes for cookout/grilled dinners. 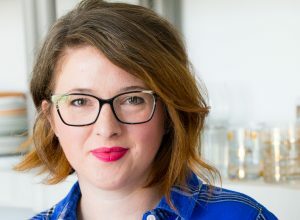 I’m 100% into Summer cooking right now. I want all my food grilled or cold in some type of salad. Anyway, back to grocery shopping. Did I mention that our new house is only 1 mile away from the Meijer that I usually shop at? 1 mile!! I am so excited. I love being close to grocery stores! Even with our CSA starting next week, we only get a half-share and therefore always need to supplement a little, particularly at the beginning of the season when the boxes are light. Well, Meijer is one of my favorite places to go for fresh produce. Bolthouse® Farms, Earthbound Farm®, Grower Direct® California Cherries, HMC Farms & SunWest Fruit Company, Marzetti® Company, Mastronardi Produce – SUNSET® Tomatoes on the Vine, NatureSweet® Cherubs® Heavenly Salad Tomatoes & NatureSweet® SunBurstsTM Sweet Golden Snacking Tomatoes, Potandon Produce – Green GiantTM Fresh Klondike Rose® & Red Potatoes; Shuman Produce – RealSweet® Vidalia® Onions, and Well-Pict Berries® Strawberries. In partnership with these brands, Produce for Kids will donate at least $50,000.00 to Jump with Jill. You guys may remember last year when I made my caramel apple rings with some of these great products to help support their campaign. A had a great time finding all of the veggies we wanted for our summer pasta salad. He loved finding the Jump with Jill signs all around the produce section at Meijer. 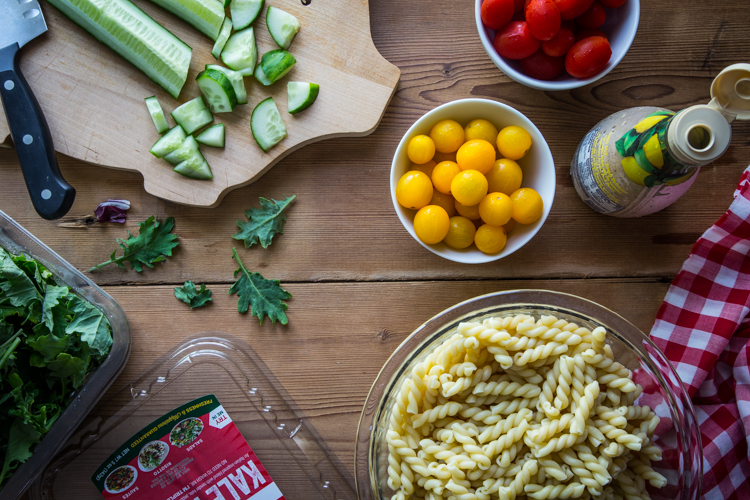 Growing up, my mom always made pasta salad packed full of vegetables. It was my absolute favorite! 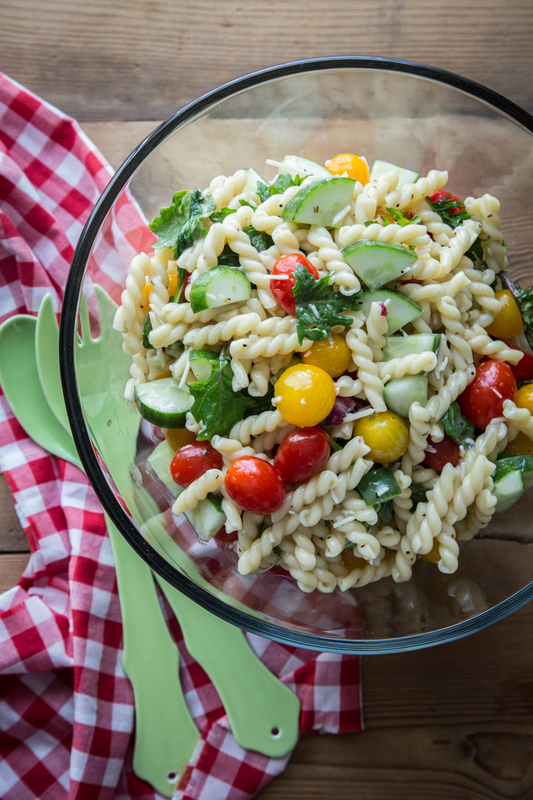 This pasta salad with tomatoes and cucumbers is a spin on her classic recipe. We used a bunch of NatureSweet tomatoes – both Cherubs and Sunburts. Also some sliced cucumber and a few handfuls of my new obsession: Earthbound Organics Kale Italia mix. Woah, these greens are something special and this pasta salad is a great way to get some extra greens into your kiddos diet. The whole salad is topped off with the light, lemony vinaigrette from Marzetti Simply Dressed dressings. Light, tangy and simple. C couldn’t stop herself from eating directly out of the giant bowl of pasta salad. I think she stole more tomatoes when I had my back turned than I could count. Tomatoes are her fave. I’m planning on many more simple summer sides coming up in the following weeks. Making awesome summer food is pretty much the best way I can think of to pass the time until we move. For more information about the Produce for Kids campaign, visit www.produceforkids.com. You can also follow Produce for Kids on Twitter, Facebook, Instagram and Pinterest. Disclosure: I received a gift card to Meijer from Produce for Kids to cover the cost of ingredients for this post. All opinions are, as always, 100% my own. In a very large bowl toss together cooked, rinsed pasta, tomatoes, cucumber, and kale. Drizzle with dressing and sprinkle with cheese; toss to coat. Salad can be served immediately or chilled for several hours. Store leftovers in the fridge for up to 3 days. Enjoy!